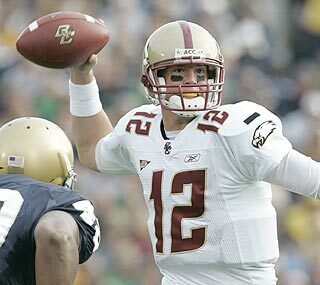 This is Matt Ryan in 2007 on the road in Notre Dame stadium, manning then #4 BC on the road to a closer-than-it-should-have-been win over the 1-5 Irish. I'm going to assume the ball was a perfect spiral. I like remembering things the way I prefer. I want you to consider something: even though the scoreboard read BC 27-ND 17 as dusk settled over the Indiana sky, that game ruined BC's season. But after we win, let's keep our excitement in the stands. Storming the field is about being an underdog, and Notre Dame is never an underdog against Boston College - regardless of our record. We should never expect to lose to Boston College. And when we beat them this weekend, let's act like we've done it before. -Bob Griffin, ND '07, ND Observer, October 9, 2007. N.b., author was an alum when this was published. You knew they never believed it, to be honest. No matter how much an ND alum wanted you to think of it, the Weis backed ND squad in 2007 was in no shape to do much of anything against BC. There was a reason they only managed one win so far that season - on the road against UCLA the week prior. Representing their only 1-A win to date (since, well, ND doesn't play 1-AA), UCLA was in the final year of a head coach and down two QBs by late September before playing the Irish. It wasn't a strong, confidence inspiring win with a top five team coming to town. So why the chest-beating? The baseline argument of Bob Griffin, et al was, of course, that ND still had the echoes to wake up. They had a bad taste in their mouth from 2002 and 1993 and finally - FINALLY! - had their chance to avenge their forefathers. And when they did, ooooooooh boy were they going to remind us where we stood. It didn't happen. But they still broke something up: some lofty dreams in BC that perhaps the 23 years of football relevance had finally put us into a new category of perennial football schools. Later that evening, #3 LSU would lose in Triple OT and #2 Cal would fall against Oregon State. BC would rise to #2 in the rankings and we couldn't believe it. Bowl predictions had us in the National Title game against Ohio State. Our rise to new football powerhouse was going to go through THE Ohio State. There were many moments left to happen that year - the miracles in Blacksburg and Clemson, the heartbreak against Florida State and the WTF against Maryland. It wasn't the lofty ranking that sealed BC's fate to keep it out of the national title picture. The reason the season started to change was less gut and more reality: BC lost senior guard Ryan Poles, who had played a killer year to date, to an Achilles injury in that ND game. It meant that BC was going to have two guards: Ty Hall, a good option when surrounded by the deep line, and Cliff Ramsey, with all of three previous appearances in his four years at BC before 2007. It changed BC's play calling, and it shouldn't be surprising that the fast Florida State was able to disrupt BC and hold them to 63 yards rushing. From there, the dream didn't have much steam left - and the month of November had its ups in Clemson before the blocked point after in the ACCCG kept BC away from the Oranges. I haven't seen an editorial in the Heights this week that urges Superfans to stay in the stands in the event of a shocking win. Let's be honest, we'd rush the field - including from the Alumni corners where the old brats like me hang out. But that's kind of early thinking, if you ask me. BC is not really in a position to pull off an upset for the century, although if it happens, I'll be framing the Sports Illustrated cover along with the rest of you. But that doesn't mean we can't ruin their season like they slowly did to ours in 2007. While we're being realistic, BC is not likely to win either of its two other games on the year, and that while a loss means sure ruin for Notre Dame, a win may create a slow death, too. ND has to keep up with the beast that is Alabama, and then K-State (in a weak Big-12) and Oregon (in a weak Pac-12) while navigating a finale with USC. Style points mean squat in a win over BC - the more we lose, the more the computers tell them they should have scheduled Georgetown if they were just going to push around a Jesuit school. Just because Nate Silver is the media darling right now doesn't mean that BC ruining ND through math is worthy of a cover story. And sleep well, because a changing of the guard and a new philosophy under Brian Kelly is what brought ND to this moment. Perhaps, dreaming Eagles, our Brian Kelly is out there. BC has a few years until ND returns to Chestnut Hill, and by then, hopefully we can get back to being hopeful about non-magical upsets.